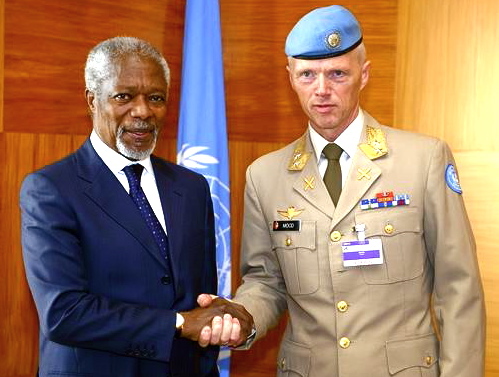 ArabSaga: Syria trips up "blue berets" after "yellow vests"
The Norwegian Army’s former Chief of Staff Major-General Robert Mood, 54, who was nominated to head the observers mandated by the UN Security Council to oversee implementation of a full cessation of armed violence by all parties in Syria has walked away and returned to Oslo. Susan Rice, the U.S. ambassador to the UN, says new attacks by Syrian regime forces and their intensified bombardment of Homs "call into question the wisdom and viability" of sending a full UN ceasefire observer mission to Syria. The Emir of Qatar, Sheikh Hamad bin Khalifa Al Thani, says chances of Kofi Annan’s six-point plan for solving the Syria crisis "are no higher than three percent." The Daily Star, Lebanon’s English-language daily, believes Gen. Mood took himself off from the UN observer mission to avoid becoming a “false witness” to the ongoing tragedy in Syria. And in his daily column for Saudi Arabia’s Asharq Alawsat, Egyptian political analyst and the Middle East’s pioneer talk show host Imad Adeeb is at a loss to explain how the Arab League, the UN secretary-general, the UN Security Council and Kofi Anan can believe -- “even for a split second” – that Damascus would cease armed violence against civilians. “With the first of the UN observers having arrived to Syria, and regime violence showing no sign of abating, it is becoming apparent that the Security Council mission has little to no purpose. Since the ‘ceasefire,’ backed by the United Nations, came into effect Thursday, activists say around 55 people, mostly civilians, have been killed across the country, with Monday bringing news of continued shelling in several cities. Over the last 13 months there have been a multitude of appeals and recommendations to President Bashar al-Assad, from a variety of international and regional bodies and institutions, all of them ignored and manipulated as a method of biding time and extending the bloodshed. It appears that this UN mission, sold as an integral part of Kofi Annan’s six-point plan, is more of the same, and perhaps even more dangerous: masking as it does the real extent of the violence and killings, with the observers on a guided tour of the country’s calm spots, having been warned that they bear responsibility for their own safety should they stray from the sightseeing tour. The mystery of the missing mission chief – Norwegian Gen. Robert Mood, who arrived in Damascus two weeks ago, only to return to Oslo with an apparent vow of silence, and who has now been replaced by Moroccan Col. Ahmed Himmiche – should be cause for concern. While the UN has insisted there is no problem, it seems evident that Mood took umbrage with the extent of the mission’s reach in Syria, and its ability to have a real impact on the outcome of the ceasefire. Again, as with the failed Arab League observer mission in January, the Syrian authorities are using this as an opportunity to bide their time, demanding details on the observers’ backgrounds and home countries. And with their movement so restricted, the observers are merely false witnesses to the ongoing tragedy in Syria. Denied access to the worst hit cities and towns, or to the victims of government abuses, they will observe but a portion of the reality, and a warped one at that. In order for the United Nations, and the wider international community, to preserve a shred of credibility and respectability, the observers would follow Mood’s route and abandon the mission and refuse to provide the regime with any more legitimacy. Otherwise they will share responsibility in the continued killings of innocent people. By acting as the message-carriers for the Syrian regime, the UN observers are contributing to the farce of the entire resolution, passed at the weekend, which only seems to be covering up the crimes of the regime, and allowing government agents time to breathe. In an-Nahar, Khoury says Mood quit probably to evade becoming a Norwegian duplicate of Mustafa al-Dabi, the controversial Sudanese general who headed last year’s failed Syria observer mission. He didn’t want the UN’s “blue berets” to face the same breakdown as the “yellow-vested” Arab League observers. “Sine the U.S. presidential elections are looming and France, Russia, China and the United Kingdom are busy with past, present or future ballots or with such issues as unemployment, energy prices, European debt and the value of the dollar,” the bloodbath in Syria will prolong.